It’s hard to age whales, and it’s usually done by looking at the proportion of right-handed amino acids in the eye-lens proteins, a proportion that increases with age. 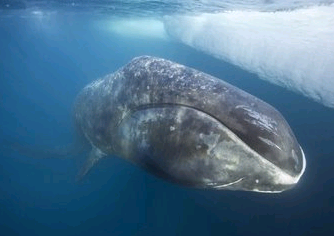 A more direct estimate, showing the extreme longevity of these leviathans, was just obtained from dissection of a bowhead whale (Balaena mysticetus) killed by Inuits off the coast of Alaska. According to MSNBC, an explosive (but perhaps unexploded) lance tip was found embedded in the whale’s blubber, a tip estimated at more than 100 years old. The whale, then, was estimated to be between 115 and 130 years old. Ironically, it was killed by a more modern version of the explosive lance. I guess Inuits have been using the ol' "What if I only put the tip in ...?" wheedle for a long time.